Would others like to see this provided as an option? Dare I ask about February 29th? Not sure how many others have the same problem as you. A manual workaround would be to specify start and stop dates for your odd days schedule. If you create one schedule to run in April and May - ending on May 30, then a second duplicate schedule starting June 1, ending July 30, you can avoid watering on May 31st. Once May 31 has passed, you can change start dates on schedule for May to run Aug 1-30 to bypass Aug 31. Not perfect, but a workaround you can set up in advance. This won’t work for flex daily as a zone can only be in one flex daily schedule. I have a similar problem – I want to water every 4 (or N>2) days, but like many others I also have a city restriction to water only on the odd days because of my address. If the rules disallow a given date, then the next date that meets the restriction rules is selected and the schedule proceeds from there. This way ad hoc manual schedule changes are eliminated and we comply with our city ordinances. 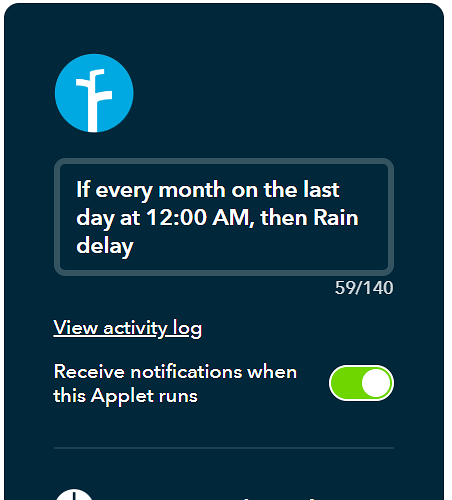 I do use Flex Daily, since that’s supposed to be the “smartest/most economical” schedule and thus, according to you, this workaround won’t work for me. Under schedule it has Odd or Even. Sounds like it would be a VERY simple update to add a 3rd option that says "Odd days excluding 31st and Feb 29"
Feb 29th is not a need for me, since I don’t water my lawn while getting a foot of snow, but I assume people in Florida/Cali may still water their lawn in February.